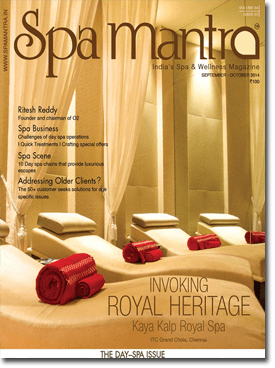 Spa Mantra is the premier magazine for the Indian Spa Industry, and acts as the preferred source of information for this fast growing industry. The Indian Spa Industry is growing at the rate of 15-18% every year and will see over 700 new spas in the next two to five years*. Spa Mantra has a controlled circulation of 5000 of the country’s best spas. The magazine boasts of being an industry resource and a exhaustive guide to the industry and is published bi-monthly nationwide. Spa Mantra is the industry’s favorite trade magazine providing detailed information about the latest spa news and updates about products from in and around the country and internationally. Spa Mantra also provides essential information about to various spas in the country with regard to the effectiveness of their treatments and the uniqueness of their appearance and presentation. The bi-monthly also covers topics like education, staffing, sustainability and new ingredients or equipment in the spa world. Spa Mantra has become indispensable for every spa owner arming them with competitior developments, latest ideas and trends and hands-on information about the new techniques from around the world.